Omaha Steaks®, a 101-year-old fifth-generation family-owned company and the nation’s leading provider of exceptional steaks and premium gourmet foods, announced today the launch of Butcher’s Breakfasts, adding to their already popular Skillet Meal offering. 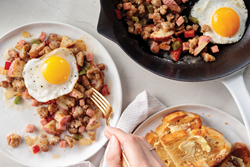 “These butcher inspired breakfasts include everything you need to make a quick gourmet brunch, breakfast or even dinner at home,” said Todd Simon, Senior Vice President and Family Owner of Omaha Steaks. Omaha Steaks®, a 101-year-old fifth-generation family-owned company and the nation’s leading provider of exceptional steaks and premium gourmet foods, announced today the launch of Butcher’s Breakfasts, adding to their already popular Skillet Meal offering. The new hearty Butcher’s Breakfasts were designed in response to customers’ requests for a hearty breakfast solution to start their day right. The new Skillet Meals are packed with plenty of premium Omaha Steaks meat and go from freezer-to-table in 15-minutes or less. Meat Lover’s- a trio of juicy, flavorful pork favorites that start your day right. The meal has plenty of lean pork sausage, all-natural ham, and uncured bacon, plus roasted red potatoes, peppers, and onions in a perfectly seasoned gravy. Chorizo & Sweet Potato Hash- flavorful all-natural chorizo sausage front and center in a hearty meal. Our Chorizo is a spicy pork sausage made with paprika and chiles (and no artificial ingredients), and it’s served with sweet potato, red peppers and onions. Ranchero Steak & Beans- perfectly seasoned steak and savory uncured bacon, and a colorful, flavorful blend of chilies, tomatoes, veggies, and spices. The new Butcher’s Breakfasts expand Omaha Steaks current offering to more than 20 Skillet Meals that go from freezer-to-table in 15 minutes or less. Omaha Steaks continues to add to the line of Skillet Meals launched last August with new big-flavor recipes including customer favorites like Tempura Orange Chicken, Italian Chicken Piccata, Asian Pepper Steak, Steak Diane and Shrimp Scampi among others. “Due to the overwhelming response that we continue to see with our meals, we plan to continuously develop new and exciting flavors,” Simon added. All Omaha Steaks meal solutions including Skillet Meals, Slow Cooker Meals and Omaha Steaks meals are specifically designed to make preparing high-quality family meals convenient and easy. These products will be available exclusively through Omaha Steaks who will market the collections online and at its more than 60 retail locations nationwide. For more information about Omaha Steaks new meals, visit http://www.OmahaSteaks.com. America’s Original Butcher, Omaha Steaks, founded in 1917, is an Omaha, Nebraska-based, fifth-generation, family-owned company that markets and distributes a wide variety of the finest quality USDA-approved, grain-fed beef and other gourmet foods including seafood, pork, poultry, side dishes, appetizers, complete meals and desserts. Today, Omaha Steaks is recognized as the nation’s largest direct response marketer of premium beef and gourmet foods, available to customers by calling 1-800-228-9055, online at http://www.OmahaSteaks.com or at retail stores nationwide.